The Lord wants to give us faith-filled friendships, yet sometimes hurts from our past relationships hold us bound from moving forward in cultivating meaningful connections with others. So, imagine if we allowed the Holy Spirit to heal us from the wounds inflicted by others and help us by giving us the blessing of fabulous faith-filled friendships. Do you feel lonely or long for better friendships in your life? Jesus tells us in Matthew 7:7, “Ask and it will be given to you; seek, and you will find; knock, and the door will be opened to you.” He exhorts us to ask for our heart’s desire. What could be better than a wonderful faith-filled friend who can support us on the rocky road of life? I have found that these type of friendships don’t just fall from the sky, but rather they need to be cultivated and developed over time. One of the things that hurt our ability to develop meaningful friendships is when we experience a painful relationships with someone in the past. Such a person is more like a “frienemy” (a friend who also functions as an enemy) than a fabulous friend. 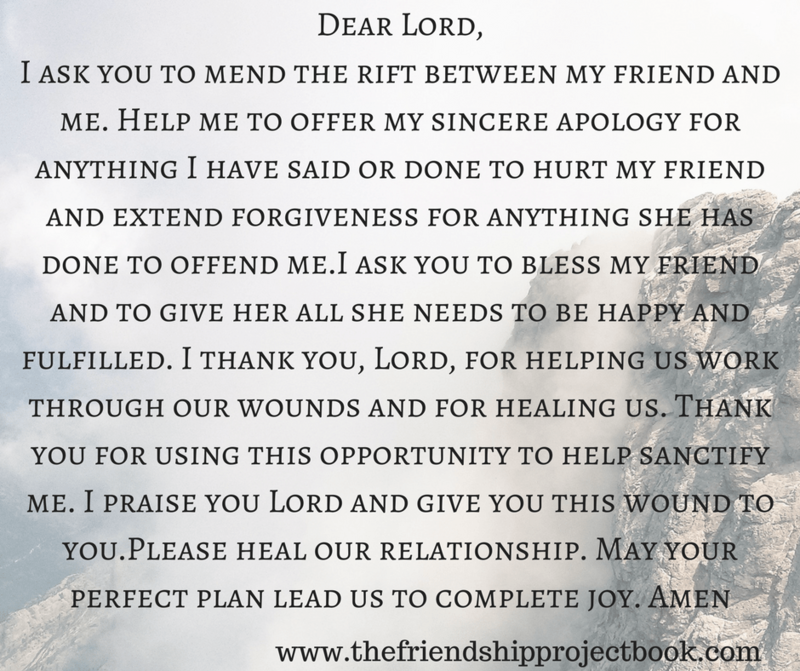 In my most recent book, that I co-authored with a friend, entitled “The Friendship Project”, there is a prayer that Michele and I wrote based on the formula for healing shared with us by Fr. James Blount, SOLT. 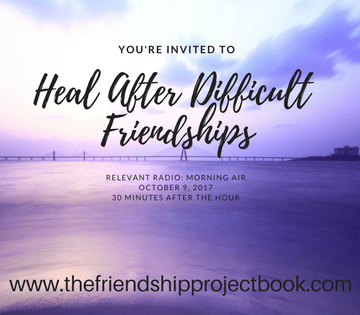 We apply the principles that he suggests for treating the heart to healing after difficult friendships! I ask you to mend the rift between my friend (_______) and me. Okay Holy Spirit, give me the name of the person with whom you want my relationship to be healed. Please heal the brokenness between us so that when I hear her name it is no longer painful. I know that the rift between us is the product of our fallen nature and is not the will of God. Allow this moment now to be a step toward moving out of pain and darkness and into a place of healing and peace. Help me to offer my sincere apology for anything I have said or done to hurt my friend and extend forgiveness for anything she has done to offend me. This is a challenging thing to do. It is easy to be embarrassed about how you might have acted, and you might even have a desire to want to apologize, but doing it can be very difficult. So let us ask the Lord to help us. Even our Lord experienced this deep pain associated with close friends- Judas betrayed Christ with a kiss. How hurtful it must have been to begin the His Passion at the hands of a “friend.” In Matthew 26:48, we learn that Jesus answered Judas with, “Friend, do what you have come for.” Then stepping forward they laid hands on Jesus and arrested him. Jesus was still offering the hand of friendship despite the betrayal and pain. What kind of friend was Peter to Jesus during the Crucifixion? In Matthew 26:69: it states, “Now Peter was sitting outside in the courtyard. One of the maids came over to him and said, “You too were with Jesus the Galilean.” But he denied it in front of everyone, saying, “I do not know what you are talking about!” Peter denies even knowing the Lord! We all need to take some time to allow the Lord to show us how we have hurt him and others. Do we deny the Lord, do we enable peer pressure, selfishness or pain to prevent us from moving forward in our friendships? I ask you to bless my friend and to give her all she needs to be happy and fulfilled. Let’s pray for blessing on those that have hurt us so that we can allow God to change our hearts. Can you believe that we are going to ask the Lord to bless the person that has caused so much hurt and pain? This might seem awkward at first, but it will not only bring you healing, it will grow your heart to be more generous and to give to others. Jesus wants to make us all whole- or holy… so allow this moment to be a moment where you will desire Christ to help the person who has hurt you. I thank you, Lord, for helping us work through our wounds and for healing us. Thank you for using this opportunity to help sanctify me. Friendships can sanctify us! Relationships are essential to leading us on the road of sanctification. Yes, we need to be sanctified in this life so to be better prepared to meet the Lord. In life we will find that only through interacting with others do we see our “warts and barnacles”, and we can choose to be more virtuous especially when we allow others to be the sandpaper of our life in leading us to heaven. I praise you Lord and give this wound to you. The Lord can always heal us and show us His mercy! I believe and know that Christ can bring healing in my heart so that I can move on from the pain of my broken friendships and seek out the friends he wants me to have.